Science is a massively parallel human endeavor to explain and predict the nature of the physical world. In science, knowledge is acquired cumulatively and collaboratively—and the principal mode for sharing this knowledge is the institution of scholarly publishing. In science, ideas are built upon ideas, models upon models, verifications upon prior verifications. This cumulative process of construction leaves behind it a latticework of citations, from which we can reconstruct the geography of scientific thought and retrace the paths along which intellectual activity has proceeded. The Eigenfactor® Project is an academic research project co-founded in January 2007 by Carl Bergstrom and Jevin West (pictured below), and sponsored by the West Lab at the Information School and the Bergstrom Lab in the Department of Biology at the University of Washington. We aim to use recent advances in network analysis to develop novel methods for evaluating the influence of scholarly periodicals, for mapping the structure of academic research, and for helping researchers navigate the scholarly literature. We are committed to broadly disseminating our research findings and technological developments, while respecting the confidentiality of the data sources we use. The Eigenfactor project has been fortunate to receive funding and data from a number of institutions and organizations, including the following. 1. Eigenfactor® scores and Article Influence® scores rank journals much as Google ranks websites. Scholarly references join journals together in a vast network of citations. 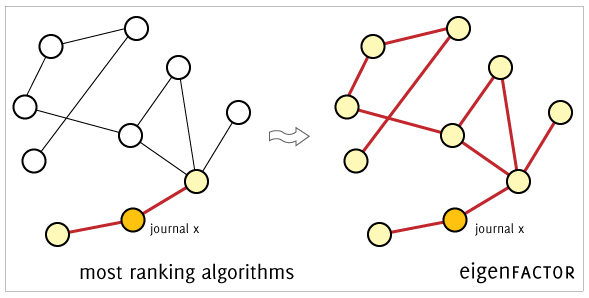 Our algorithms use the structure of the entire network (instead of purely local citation information) to evaluate the importance of each journal. 2. Eigenfactor.org reports journal prices as well as citation influence. In collaboration with journalprices.com, Eigenfactor.org provides information about price and value for thousands of scholarly periodicals. While the Eigenfactor Scores and Article Influence Scores do not incorporate price information directly, the Cost-Effectiveness Search orders journals by a measure of the value per dollar that they provide. 3. Eigenfactor® scores and Article Influence® scores adjust for citation differences across disciplines. Different disciplines have different standards for citation and different time scales on which citations occur. 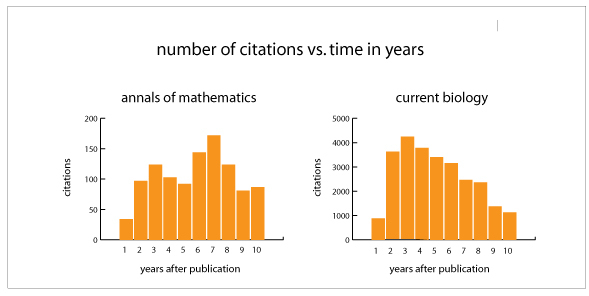 The average article in a leading cell biology journal might receive 10-30 citations within two years; the average article in leading mathematics journal would do very well to receive 2 citations over the same period. By using the whole citation network, our algorithm automatically accounts for these differences and allows better comparison across research areas. 4. Eigenfactor® scores and Article Influence® scores rely on 5-year citation data. In many research areas, articles are not frequently cited until several years after publication. Therefore, measures that only look at citations in the first two years after publication can be misleading. The Eigenfactor score and the Article Influence score is calculated based on the citations received over a five year period. 5. The Eigenfactor® metrics are freely available. Under an agreement with Thomson-Reuters, we are able to bring you the Eigenfactor metrics here at Eigenfactor.org free of charge. Scores will appear here annually, six months after they are released in the Thomson-Reuters Journal Citation Reports. How do I interpret a journal's Eigenfactor® score? A journal's Eigenfactor score is our measure of the journal's total importance to the scientific community. With all else equal, a journal's Eigenfactor score doubles when it doubles in size. Thus a very large journal such as the Journal of Biological Chemistry, which publishes several thousand articles per year, will have extremely high Eigenfactor scores simply based upon its size. Eigenfactor scores are scaled so that the Eigenfactor scores of all journals listed in Thomson's Journal Citation Reports (JCR) sum to 100. Thus if a journal has an Eigenfactor score of 1.0, it has 1% of the total influence of all indexed publications. In 2013, the journal Nature has the highest Eigenfactor score, with a value of 1.603. What is the Normalized Eigenfactor® score and how does it relate to the Eigenfactor score? The Normalized Eigenfactor score rescales the Eigenfactor score to make the scores easier to read an interpret. The Normalized Eigenfactor score is scaled so that the average journal has a score of 1. Journals can then be compared and influence measured by their score relative to 1; a journal with a Normalized Eigenfactor Score of 3 has three times the total influence of the average journal in the JCR. Mathemetically, the Normalized Eigenfactor score is equal to EF*N/100, where EF is the corresponding Eigenfactor score and N is the number of journals in the JCR in the year in question. Because the Normalized Eigenfactor score is a simple multiplicative rescaling of the Eigenfactor score, the percentile rank of the jounal is the same for both metrics and the ratio of two journals' scores are also the same for the two metrics. How do I interpret a journal's Article Influence® score? A journal's Article Influence score is a measure of the average influence of each of its articles over the first five years after publication. Article Influence score measures the average influence, per article, of the papers in a journal. As such, it is comparable to Thomson Scientific's widely-used Impact Factor. Article Influence scores are normalized so that the mean article in the entire Thomson Journal Citation Reports (JCR) database has an article influence of 1.00. In 2006, the top journal by Article Influence score is Annual Reviews of Immunology, with an article influence of 27.5 . This means that the average article in that journal has twenty seven times the influence of the mean article in the JCR. Do Eigenfactor® scores and Article Influence® scores take journal subscription prices into account? We do not use journal subscription prices when computing the Eigenfactor and Article Influence scores. However, we do display journal price information on the journal details pages. Our subscription cost effectiveness search ranks subscription-based journals according to the value-per-dollar that they provide, and our open access cost effectiveness tool compares the article-processing fees charged by open access journals. What are the Eigenfactor® field categories, and how do they compare to the Thomson-Reuters JCR field categories? In short, the Eigenfactor categories derive from our efforts to map the structure of science. The Eigenfactor categories differ from the Thomson-Reuters JCR categories in a number of ways. For one thing, the Eigenfactor categories form a hard partition in which each journal belongs to only one category, whereas the Thomson categories form a soft partition in which journals are allowed multiple category membership. 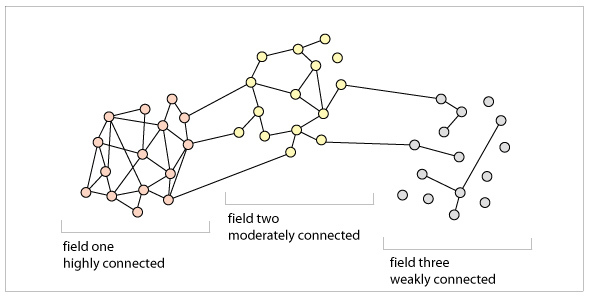 Second, our approach to mapping the structure of science is not to use our preconceived notions about what the structure of clusters or "fields" within science should be, but rather to let the data - in our case, citation patterns - tell us what the clusters or fields are. In other words, we are interested in mapping science according to what researchers do, not what they say that they do or how they self-identify. One interesting consequence of this approach is that the fields vary widely in size according to their citation behavior. Some fields, such as Tribology (the study of friction) are very small and comprise only a few journals; others fields are very large and contain multiple subdisciplines that might typically be considered separate. For example, the Molecular Biology cluster on our map includes genetics, developmental biology, microbiology, and biochemistry - areas that might be in different departments or even different colleges at many universities. Because the Thomson-Reuters JCR categories may be preferable to the Eigenfactor categories for some purposes, we list both, and we allow userse to search journal rankings by Thomson-Reuters category as well as by Eigenfactor category. The citation data used at Eigenfactor.org come from Thomson Scientific's Journal Citation Reports (JCR). The JCR provides detailed information about more than 8,000 journals in the sciences and social sciences which are indexed in the Thomson-Reuters Web of Science citation database. Information about subscription prices comes primarily from journalprices.com. What is your financial relationship with Thomson-Reuters? We do not receiving any funding or other financial compensation from Thomson-Reuters. We do exchange data. They provide us with the raw data that we need to compute the Eigenfactor metrics. In return, we provide them with the metrics and offer them a no-fee license for their use. Are your algorithms and methods proprietary? No. Bibliometric analysis is scientific only to the degree that it is open and replicable. Thus all of the algorithms and methods used to compute Eigenfactor score, Article Influence score, and the other metrics presented on this website are described in full detail with pseudocode and source code also avaiable. The mapping algorithms and related methods are described on our mapping page. Why isn't my journal ranked by Eigenfactor® score? How can I get it listed? The journal citation data for the Eigenfactor.org website come from the Thomson-Reuters Journal Citation Reports (JCR) for each year 1997-2013. Thus, to be listed on the Eigenfactor website, a journal must be listed in the JCR. At present, we have no other means for facilitating inclusion in the Eigenfactor database. Note that the Eigenfactor website does not list journals that publish fewer than 12 articles per year averaged over 5 years, nor does the Eigenfactor list journals that do not cite other journals listed in the JCR. This is because the network centrality methods that we use to compute Eigenfactor scores are highly volatile for barely-connected journals and for small journal sizes. The price/publisher/founding year/etc. is listed incorrectly for my journal. How can I fix it? Send us an email at eigenfac@uw.edu and we will make the corrections as soon as possible. Many publishers sell bundled access to collections of journals at prices that are individually negotiated institution by institution. How do you determine the price for each journal? We obtain our pricing information from journalprices.com. Even when publishers typically sell their journals as bundles, they list individual subscription prices their journals. These individual prices influence negotiations for bundle subscriptioms and are the prices that a library pays should it choose not to purchase a bundle subscription. Journalprices.com reports these list prices. We have comments or suggestions for improvements to this site and its tools. Who do we contact? Many of the useful tools we have built have been inspired by comments and suggestions from our users. We find them very useful. Please do not hesitate to email us with your suggestions or questions at eigenfac@uw.edu. I can't see the time graphs within the details section for each journal. What is wrong? Our tools work in most browsers. They work best in Chrome, Firefox and Safari. If you are using a version of Internet Explorer prior to IE9, this is probably the reason you are having issues with the time graphs. What is the Cost Effectiveness metric? Not all journals are cited the same, nor are they priced the same. In order to compare journals both in Eigenfactor and price, we have come up with a metric called Cost Effectiveness (CE). CE is essentially the price divided by its Eigenfactor Score. The Eigenfactor scores for a given year sum to 100. We can do the same for price. The ratio of these two scaled numbers gives us CE. All else being equal, a journal would want a low Cost Effectiveness score. The average CE score for all journals is equal to 1. So, a journals with a CE value of 5 is 5 times the price/ef of the average journal in the collection. How do I link to the Eigenfactor metrics for a specific journal? On the Journal Ranking page, you can search by the exact journal title and narrow the output to one year. In this way, you can have one journal title to link to. This search will not output other journal titles with similar names or the same journal for different years. This is an efficient way of sending hyperlinks of specific journals. Could you send me a file with all the Eigenfactor Scores and Article Influence Scores for a given year? Our data usage agreement with Thomson-Reuters prevents us from directly sharing bulk data on Eigenfactor scores and Article Influence scores. However, Thomson-Reuters enthusiastically supports bibliometric research based upon the Eigenfactor metrics and they been extremely helpful in providing this type of data to interested research groups at universities that subscribe to the Journal Citation Reports. Feel free to contact us at eigenfac@uw.edu and we will be happy to help you obtain this data from Thomson-Reuters. How many journals do you rank? The number of journals listed has increased steadily each year. For 2013, we rank 11,002 journals. By way of comparison, for 1997 we listed only 6,439 journals. This webpage is designed and implemented by Yea-Seul Kim and Ray Hong.